On the fringes of Southeast Asia, Hong Kong and Taiwan are characterized by hot muggy summer nights. At the end of long work-days, the streets light up with restaurants and night markets enticing with their array of fried snacks, fresh fruit juices, and grilled meats. With nights slightly cooler than the daytime, friends, date-night couples, families and dogs venture out to relax and enjoy the sounds and flavors of the night-market culture. 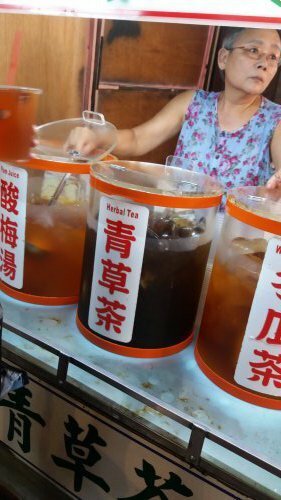 One of the features in the landscape of tempting eats are stalls that sell herbal teas to cool off from the summer heat. There are decoctions of ume plum, herbal blends, or fresh fruit juices using bitter melon and si gua lou as bases for their medicinal cooling properties in Traditional Chinese Medicine. With temperatures here soaring into the nineties, the heat of summer can cause all kinds of unpleasant symptoms, from headaches to nosebleeds. In Traditional Chinese Medicine, the ingestion of foods with cooling properties is considered part of a wholistic lifestyle that balances human activity with the changes of the seasons. In Southern China, Guangdong province has a long tradition of treating ailments that arise from the summer heat with Chinese medicinal drinks. Sunburn, heatstroke, sinus infections, summer flus, are tended to or avoided by the ingestion of herbal teas. Some of the ingredients you will encounter in these cooling drinks are lotus leaf, mint, chrysanthemum, plum, hawthorn, and honeysuckle. Here are a couple of variations on traditional recipes that you can try at home. Simmer lu gen and jin yin hua in 5 cups of water over medium heat for 30 minutes. Add lu dou and cook for an additional 15 minutes, reducing the liquid down to about 1 cup. Add bo he last, turning off the heat and let it sit for 5 minutes. Strain and serve. Put herbs in a pot with 4 cups of water and bring to boil. Lower heat to medium and continue to cook for about 20 minutes. Strain tea, add sugar to taste, and serve. The secret to staying healthy in summer, which has a long tradition in Chinese culture, is to eat light and keep the body temperature cool, with the help of these heat-relieving foods.